Back in the 1980's Jean Mill (Millwood Bengals (USA) thought how wonderful it would be to have a domestic size cat with the exotic look and markings of a Leopard! Jean acquired an Asian Leopard Cat (Felis Bengalensis) which is a small,forest dwelling wild cat that inhabits parts of Asia.Its markings are similar to that of the Leopard. 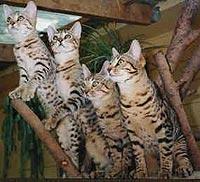 The next step was the mating of the Asian Leopard Cat to the American Shorthair and domestic cat she used these cats to stabilize the timid,shy temperament of the Asian Leopard Cat. After years of frustration and excitement the Bengal cat as we know it today emerged. We thank Jean for having the insight and determination. Jean still breeds Bengals today in California! The Bengals of today are truly a breed that intrigue and delight almost everyone who comes in contact with them.Their beautiful patterns,colours and markings along with their inquisitive nature make them a unique breed to own. Once you own a Bengal your hooked!!! Bengals come with varying background coat colours,cream,golden and orange, on these base colour's they can have either 'spotting' or the exotic 'marbling' pattern. Bengal's are boisterous,energetic and very playful,sometimes a little headstrong and quite often naughty!!! They are very intelligent and can be quite easily taught basic commands.Many walk on a leash and come when called,they love to retrieve paper or balls.They really are more dog like than cat! I am sure they know what you are going to do before you do it! I hope this introduction will encourage you in your final decision into owning one of these wonderful animals.I can almost guantee you will not regret it!